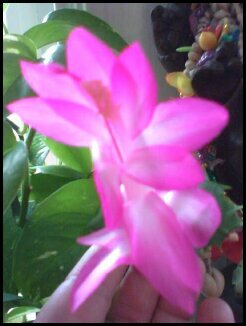 The wee Christmas cactus (a cutting from Robert’s bigger one) is blooming big time. 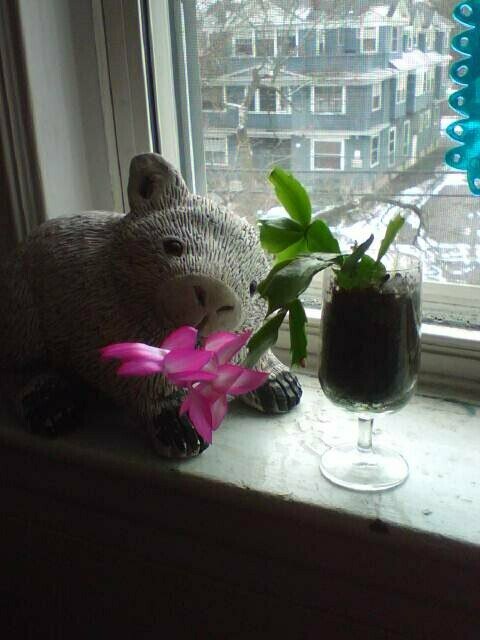 Here it is perched on the window sill with the wombat, the dusting of snow visible below (tried for a close-up which did not work so well). That’s all the winter we need. If only there were a steaming mug of hot chocolate next to it! The planter is a vintage PanAm wine glass (cracked unfortunately! ), courtesy of our pal Peter Williamson, avid pilot (Hi Peter & Pat & Aaron!). Yes, it’s from back in the day when they used glass on airplanes. Now we can’t even be trusted with cutlery. UPDATE: Impromptu winter nature walk with pal Peg Aloi today — pictures here.